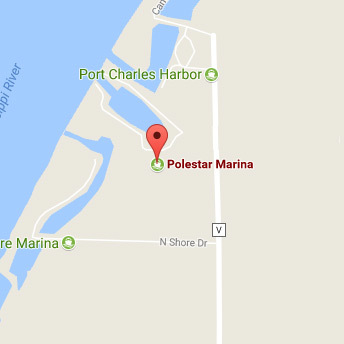 Polestar Boating Center’s full-service marina offers affordable slip rates that include several top-notch amenities and advantages. Full-service Fuel/Gas facility with Valvtect fuel additive and pump out service. Large, clean air conditioned bath house with showers, complimentary laundry and library. Wide fairways and ample lighting for easy docking at any time. Running water, locking dock box, fans down the fairway and power pedestals. Phone-accessible live video feed to see what's going on at the boating center 24/7. Protected floating dock system with slips ranging from 30-70' and end ties to accommodate larger yachts. Get to your dock and boat even during high water flooding. Free WiFi harbor wide available for our slipholders and their guests. Spider / Pest Control services performed monthly. On-site weather station provides useful weather data for water-based activities. Slipholders can relax in a tranquil, serene marina with a record of safety second to none.